Posted on 1, February 2019 by EuropaWire PR Editors | This entry was posted in Business, Electronics & Machinery, Financial, Germany, Investment, Management, News, Technology and tagged automation, digitalization, dividend, electrification, Financial, FY2018, investors, Joe Kaeser, shareholders, Siemens AG. Bookmark the permalink. Joe Kaeser, Vorstandsvorsitzender Siemens AG, berichtet den Aktionären auf der 53. ordentlichen Hauptversammlung des Unternehmens über das abgelaufene Geschäftsjahr 2018. Joe Kaeser, President and CEO of Siemens AG, reports on fiscal 2018 to the shareholders at the company’s 53rd Annual Shareholders’ Meeting. BERLIN / MUNICH, 1-Feb-2019 — /EuropaWire/ — Siemens AG shareholders have, with large majorities, approved the distribution of €3.80 dividend per share for the fiscal 2018. The ratification took place during the company’s 53rd ordinary Annual Shareholders’ Meeting. The FY 2018 dividend is higher than the dividend for fiscal 2017 with €0.10. Siemens AG dividends keep on increasing for five years in a row. The acts of the members of Siemens AG’s Managing and Supervisory Boards for fiscal 2018 have also been ratified during the ordinary Annual Shareholders’ Meeting. Their proposals and the other agenda items have also been approved by large majorities. Detailed voting results on the individual agenda items at the Annual Shareholders’ Meeting are available at www.siemens.com/agm. 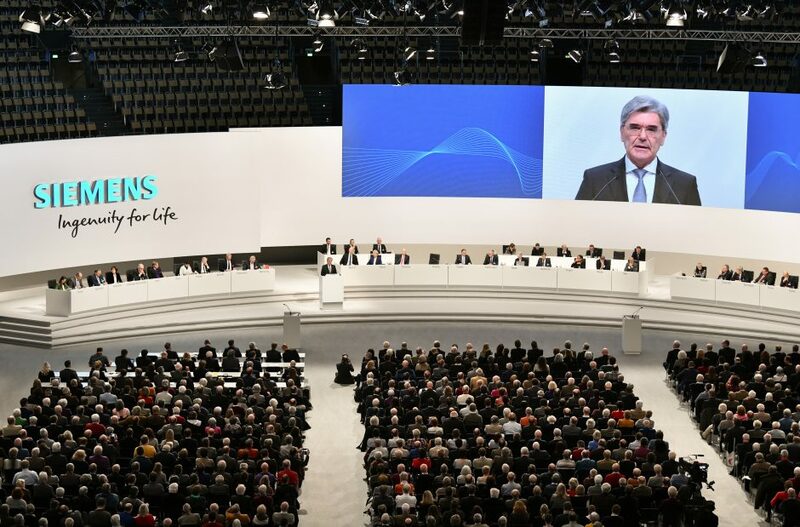 Further information on the 2019 Annual Shareholders’ Meeting is available at www.siemens.com/press/agm. Siemens AG is a global technology powerhouse established 170 years ago. The company is particularly strong on electrification, automation and digitalization relying on around 379,000 employees worldwide. Siemens had €83.0 billion revenue and net income of €6.1 billion in fiscal 2018, which ended on September 30, 2018.